I have a couple of DRY-Z that came with plastic shielded leads and changed them over to the braided wire yesterday and took a few pictures along the way. 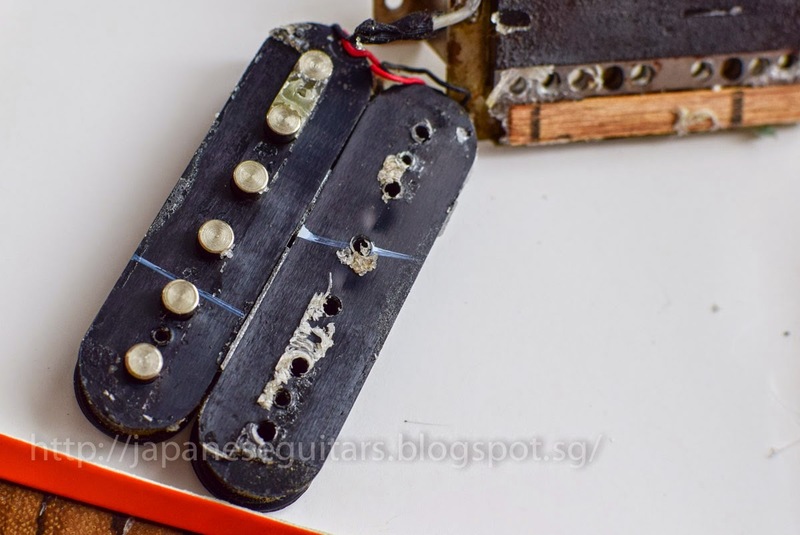 According to the seller the pickups were from an ESP strat, hence the plastic shielding to avoid problems with accidental grounding. 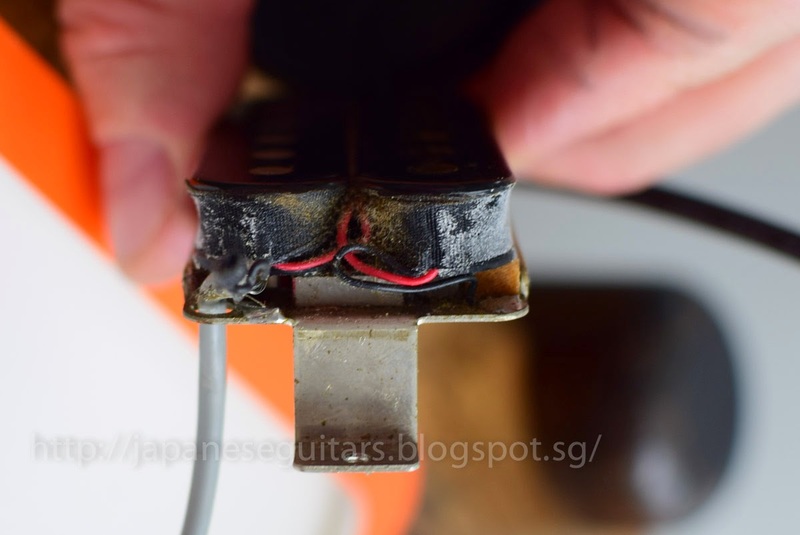 Up to now I had the Zs in my Tokai LS-150 and they completely lived up to their reputation for clarity and responsiveness. So why take them out? 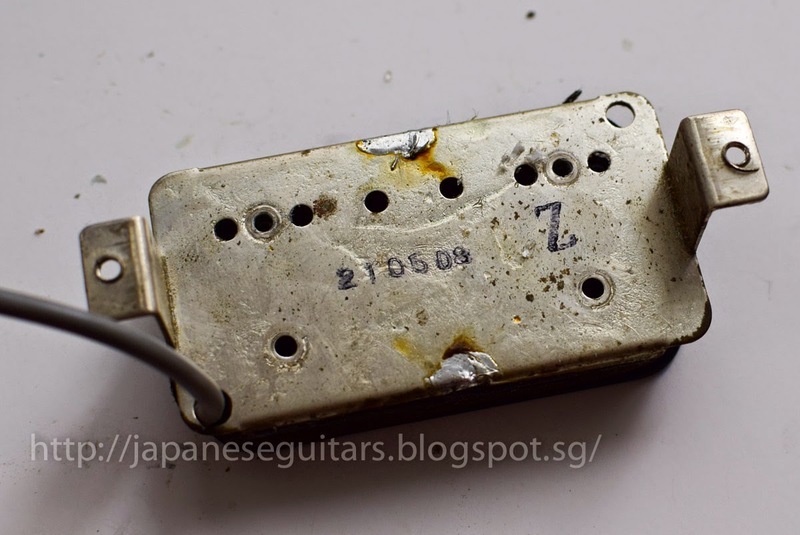 I have a nice set of Seth Lovers that I wanted to used in the LS-150 and I want to use these Zs in my Tokai LC-100 or Greco EC68-80. To deal with the lack of gold hardware I also traded the polepieces and covers with those from a set of PU-2s in gold I got from Yahoo Japan recently. After measuring the resistance I realized that the one that had been in the bridge (with a shorter lead) has lower resistance at about 7.7k compared to the neck at 8.3k. The bridge needs a bit more volume so I switched them around. 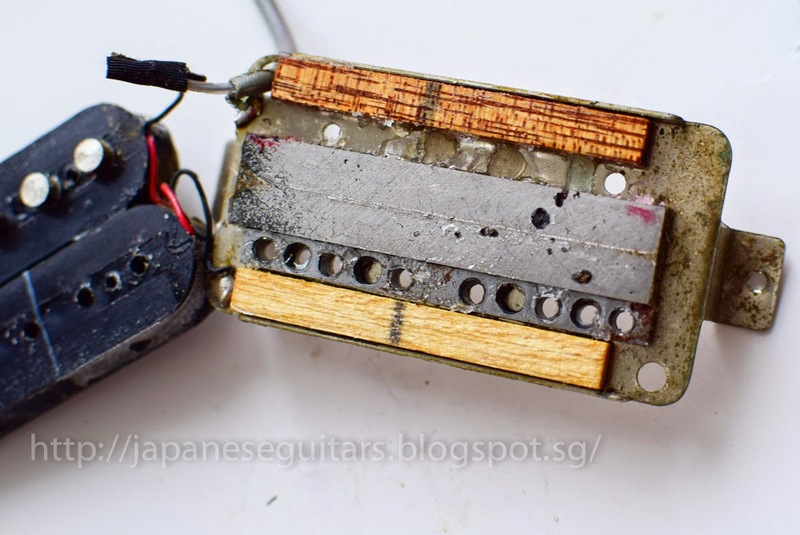 From the numbers on the baseplates these pickups were made about 5 months apart. 210509 should be May 9, 1981 and 201106 should be November 6, 1980 if I am not getting things confused. The "2" is a production line number as far as I have read and doesn't indicate the model. These were not made They could have been purchased as after-market parts which may explain the different dates. 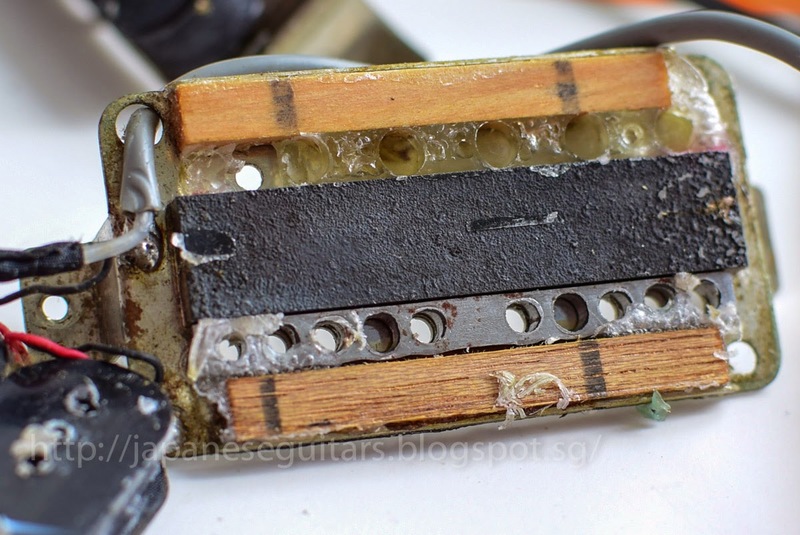 Here are some pictures to show the innards of these pickups. 210508 with bobbin removed. Maple and mahogany spacers? Note light wax potting and polished roughcast magnet. Back of the magnet showing some rough edges. Wax potting and very rough magnet surface. I didn't take this out to see if the back was the same. Ready for installation in the Greco EC68-80. I now own this set of Maxon Dry Z Pickups, is there anything else that you could tell me about this set. I am putting them in a 1982 Greco EGC58-100 Super Real (Black with the ebony fretboard). I am keeping the Grove 1982 Pickups, just upgrading to the Dry Z's with 500k pots. It should be a nice combination in the Greco custom. 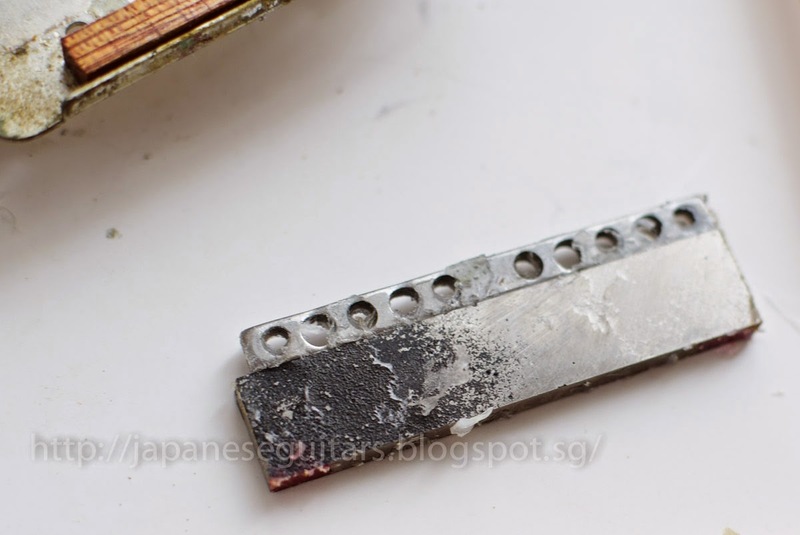 If I recall correctly the GROOVE pickups are a bit more rounded in the top end. I thought that the pots in that guitar should be stock 500k. In any case it is a great guitar and the DRY-Z set should work well. Thanks for replying to my post. You stated that "These were not made They could have been purchased as after-market parts which may explain the different dates." 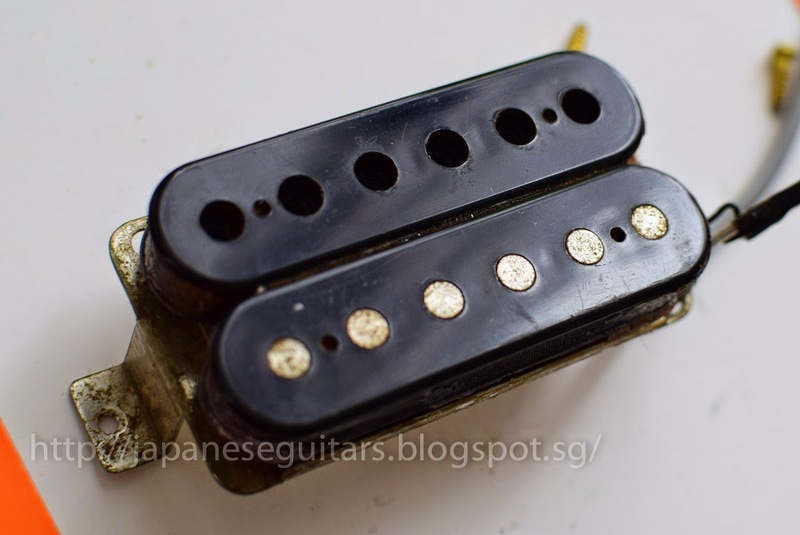 What makes you think that these were not made, but put together with after-market parts, and are these true Maxon Dry Z Pickups? I was told my the person that I purchase the pickups from that the difference in the serial numbers just means that one was made in 1980 and the other was made in 1981. 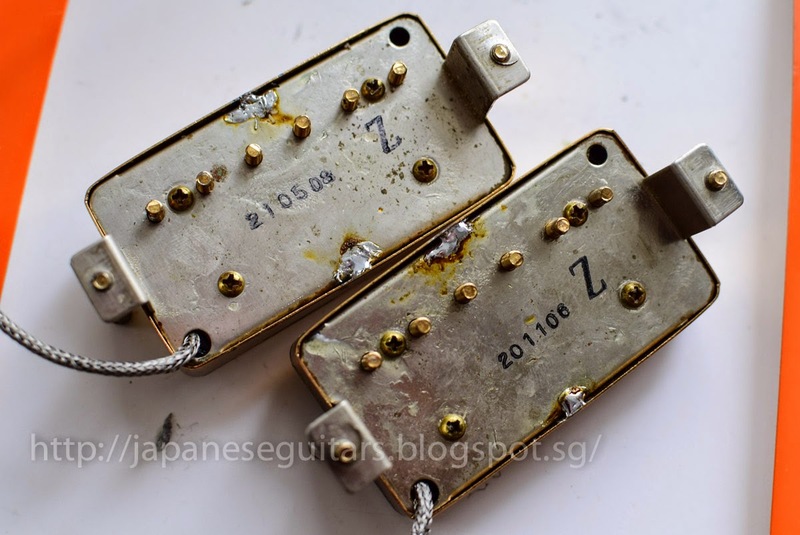 I am certain that I have this set of Dry Z Pickups because every rust spot on the back of both pickups match up exactly with the pictures that are posted here. I just want to make sure that I am installing "True" Maxon Dry Z Pickups. I see I should have edited better as I left that sentence incomplete. I meant they were not made as a paired set for a guitar but could have been bought as after-market pickups. Genuine Zs, not to worry. That is what I figured, but I wanted to make sure. Since the covers are not the original ones and were pretty worn, I sent them in to be 24k gold plated. The hardware on my Greco is in really nice condition so newly plated covers will really look good. It sounds like a great combination to me, thanks for sharing. I'm happy the guitar ended up in the right hands!